It is thought to have been contemporaneous with modern humans (Homo sapiens) on the Indonesian island of Flores. One sub-fossil skeleton, dated at 18,000 years old, is largely complete. It was discovered in deposits in Liang Bua Cave on Flores in 2003. Parts of eight other individuals, all diminutive, have been recovered as well as similarly small stone tools from horizons ranging from 94,000 to 13,000 years ago. The first of these fossils was unearthed in 2003; the publication date of the original description is October 2004; and confirmation of species status was expected to appear in March 2005, following publication of details of the brain of Flores Man. However, primatologist Robert Martin of the Field Museum in Chicago published an article in Science theorizing that the original specimen does not represent a new species, but is a modern Homo sapiens with microcephaly. Flores has been described (in the journal Nature) as "a kind of Lost World", where archaic animals, elsewhere long extinct, had evolved into giant and dwarf forms through allopatric speciation, due to its location East of the Wallace Line. The island had dwarf elephants (a species of Stegodon, a prehistoric elephant) and giant monitor lizards akin to the Komodo dragon, as well as H. floresiensis, which can be considered a species of diminutive human.The discoverers have called members of the diminutive species "hobbits", after J.R.R. Tolkien's fictional race of roughly the same height. Ever since finding the remains of the "hobbits" - a small-statured species of ancient human - on the island of Flores in Indonesia, scientists have wondered whether the modern Pygmy people who now call the island home were in any way related to them. Now, researchers have found that the answer is "no," the modern-day Pygmies on Flores are not related to the ancient hobbits, who go by the scientific name Homo floresiensis. 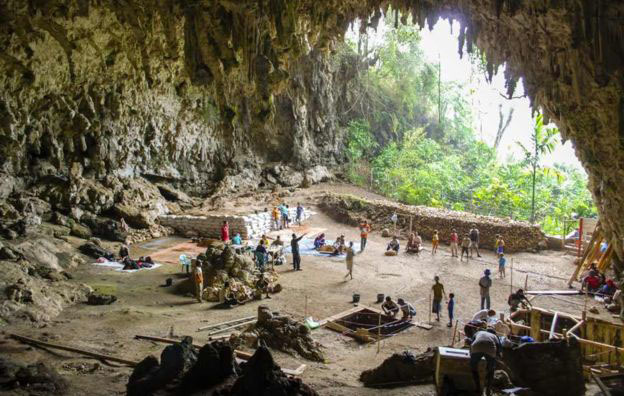 While the genomes of modern Pygmy people on Flores have DNA sequences from other ancient human relatives - the Denisovans and the Neanderthals - they have "no evidence for gene flow with other archaic hominins," the researchers wrote in the study. A new study has shown that small height evolved twice in humans on the Indonesian island of Flores. Scientists decoded the DNA of modern-day "pygmy" people to find out if they might be partly descended from the extinct Hobbit species. The remains of these Hobbits were found during an archaeological dig on Flores 15 years ago. The most comprehensive study on the bones of Homo floresiensis, a species of tiny human discovered on the Indonesian island of Flores in 2003, has found that they most likely evolved from an ancestor in Africa and not from Homo erectus as has been widely believed. The study by The Australian National University (ANU) found Homo floresiensis, dubbed "the hobbits" due to their small stature, were most likely a sister species of Homo habilis - one of the earliest known species of human found in Africa 1.75 million years ago. Half-sized humans who lived 700,000 years ago were almost certainly the ancestors of enigmatic "hobbits" whose fossils were found on the same Indonesian isle in 2013, scientists stunned by their own discovery. Two studies, published in Nature, fill a huge gap in our understanding of these diminutive people, whose tortuous evolutionary saga hit a dead-end some 50,000 years ago. A modest haul of teeth and bones from an adult and two children has bolstered the theory that the hobbits, known to scientists as Homo floresiensis, arrived on Flores island as a different, larger species of hominin, or early man, probably about a million years ago. And then, something very strange happened. These upright, tool-wielding humans shrank, generation after generation, until they were barely half their original weight and height. The process, called "island dwarfism," was well known in animals, with some species shrinking as much as six fold in adapting to an environment with fewer resources. The diminutive human species nicknamed "the Hobbit" is older than previously recognized, scientists now say. The discovery of Homo floresiensis in 2003 caused a sensation because it seemed the creature could have been alive in the quite recent past. But a new analysis indicates the little hominin probably went extinct at least 50,000 years ago - not the 12,000 years ago initially thought to be the case. Diminutive humans that died out on an Indonesian island some 15,000 years ago were not Homo sapiens but a different species, according to a study published Monday that dives into a fierce anthropological debate. Controversy has raged ever since as to whether they are an unknown branch of early humans or specimens of modern man deformed by disease. The new study, based on an analysis of the skull bones, shows once and for all that the pint-sized people were not Homo sapiens. A diminutive species of human whose remains were found on the Indonesian island of Flores could have shrunk as a result of island dwarfism as it adapted to its environment. 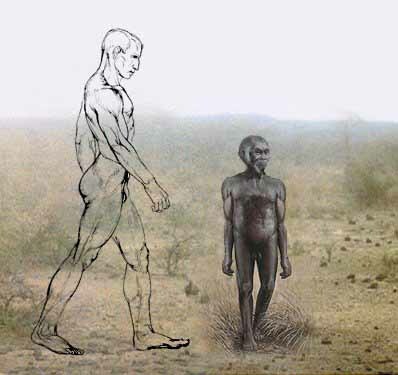 A study of the remains of the creature, nicknamed the "hobbit", shows that it is possible for it to have been a dwarf version of an early human species. The hobbit co-existed with our species until 12,000 years ago. The brain of the extinct "hobbit" was bigger than often thought, researchers say. 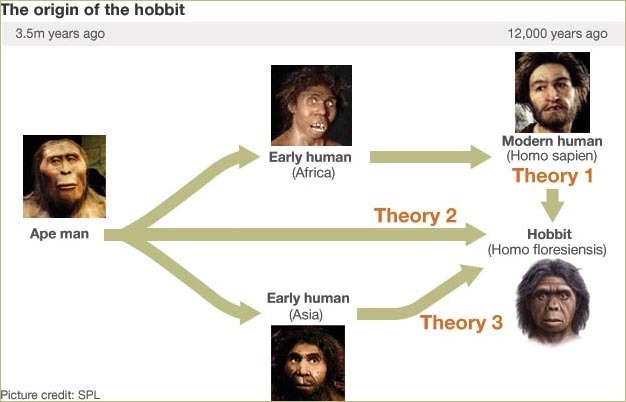 These findings add to evidence that the hobbit was a unique species of humans after all, not a deformed modern human, scientists added. The 18,000-year-old fossils of the extinct type of human officially known as Homo floresiensis were first discovered on the remote Indonesian island of Flores in 2003. Its squat, 3-foot-tall (1 meter) build led to the hobbit nickname. A new paper is set to re-ignite debate over the origins of so-called Homo floresiensis -- the 'hobbit' that some scientists have claimed as a new species of human. Researchers have reconfirmed their original finding on the skull that Homo floresiensis in fact bears the hallmarks of humans -- Homo sapiens -- affected by hypothyroid cretinism. Newfound stone tools suggest the evolutionary history of the "hobbits" on the Indonesian island of Flores stretches back a million years, a new study says - 200,000 years longer than previously thought. The hobbit mystery was sparked by the 2004 discovery of bones on Flores that belonged to a three-foot-tall (one-meter-tall), 55-pound (25-kilogram) female with a grapefruit-size brain. The tiny, hobbit-like creature - controversially dubbed a new human species, Homo floresiensis - persisted on the remote island until about 18,000 years ago, even as "modern" humans spread around the world, experts say. Found in million-year-old volcanic sediments, the newly discovered tools are "simple sharp-edged flakes" like those found at nearby sites on Flores - sites dated to later time periods but also associated with hobbits and their ancestors. Homo erectus, thought to be the immediate ancestor of H. floresiensis, was almost the same size as modern humans. In the limited food environment on Flores, however, H. erectus is thought to have undergone strong island dwarfing, a form of speciation also seen on Flores in several species, including a dwarf Stegodon (a group of proboscideans that was widespread throughout Asia during the Quaternary), as well as being observed on other small islands. However, the "island dwarfing" theory has been subjected to some criticism from. Despite the size difference, the specimens seem otherwise to resemble in their features H. erectus, known to be living in Southeast Asia at times coinciding with earlier finds of H. floresiensis. These observed similarities form the basis for the establishment of the suggested phylogenetic relationship. Despite a controversial reported finding by the same team of alleged material evidence, stone tools, of a H. erectus occupation 840,000 years ago, actual remains of H. erectus itself have not been found on Flores, much less transitional forms. The type specimen for the species is a fairly complete skeleton and near-complete skull of a 30-year-old female, nicknamed Little Lady of Flores or Flo, about 1 m (3 ft 3 in) in height. Not only is this drastically shorter than H. erectus, it is even somewhat smaller than the three million years older ancestor australopithecines, not previously thought to have expanded beyond Africa. This tends to qualify H. floresiensis as the most "extreme" member of the extended human family. They are certainly the shortest and smallest discovered thus far. 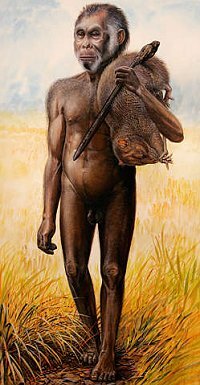 Homo floresiensis is also rather tiny compared to the modern human height and size of all peoples today. The estimated height of adult H. floresiensis is considerably shorter than the average adult height of even the physically smallest populations of modern humans, such as the African Pygmies (< 1.5 m, or 4 ft 11 in), Twa, Semang (1.37 m, or 4 ft 6 in for adult women), or Andamanese (1.37 m, or 4 ft 6 in for adult women). Mass is generally considered more biophysically significant than a one-dimensional measure of length, and by that measure, due to effects of scaling, differences are even greater. The type specimen of H. floresiensis has been estimated as perhaps about 25 kg (55 lb). Homo floresiensis had relatively long arms, perhaps allowing this small hominid to climb to safety in the trees when needed. The other remarkable aspect of the find is that this species is thought to have survived on Flores until at least as recently as 12,000 years ago. This makes it the longest-lasting non-modern human, surviving long past the Neanderthals (H. neanderthalensis) which became extinct about 29,000 years ago. Homo floresiensis certainly coexisted for a long time with modern humans, who arrived in the region 35,000-55,000 years ago, but it is unknown how they may have interacted. 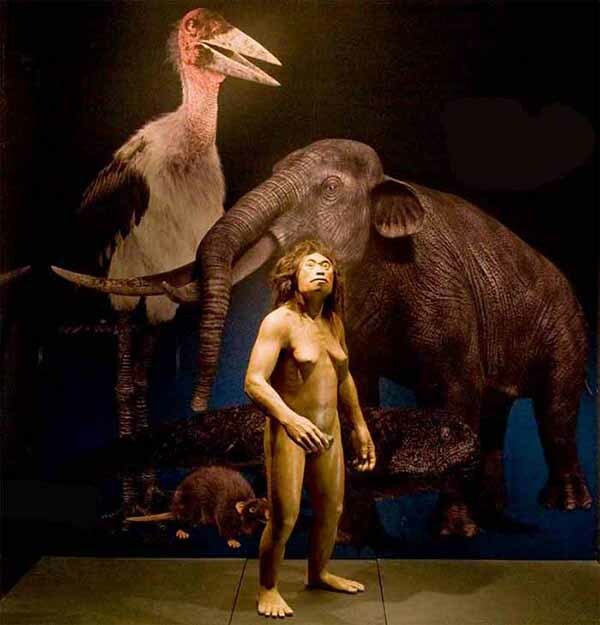 Local geology suggests that a volcanic eruption on Flores was responsible for the demise of H. floresiensis in the part of the island under study at approximately 12,000 years ago, along with other local fauna, including the dwarf elephant Stegodon. The discoverers suspect, however, that this species may have survived longer in other parts of Flores to become the source of the Ebu Gogo stories told among the local people. The Ebu Gogo are said to have been small, hairy, language-poor cave dwellers on the scale of H. floresiensis. Widely believed to be present at the time of the arrival of the first Portuguese ships during the 16th century, these strange creatures were apparently last spotted as recently as the late 19th century. There is also Tonga Island folklore that "small people" were living on 'Ata Island (the southernmost island of the group) at the time of the arrival of the Polynesians. Similarly, on the island of Sumatra, there are reports of a one-metre tall humanoid, the Orang Pendek, which a number of professional scholars take seriously. Both footprints and hairs have been recovered. Scholars working on the Flores Man have noted that the Orang Pendek may also be surviving Flores men still living on Sumatra. The discovery is widely considered the most important of its kind in recent history, and came as a surprise to the anthropological community. The new species challenges many of the ideas of the discipline. Homo floresiensis is so different in form from other members of genus Homo that it forces the recognition of a new, undreamt-of variability in the genus, and provides evidence against linear evolution.No doubt, this discovery provides more fuel for the perennial debate over the out-of-Africa or multiregional models of speciation of modern humans (despite H. floresiensis not itself being an ancestor of modern humans). Already, further arguments have been made on either side. The discoverers of H. floresiensis fully expect to find the remains of other, equally divergent Homo species on other isolated islands of Southeast Asia, and think it possible, if not quite "likely", that some lost Homo species could be found still living in some unexplored corner of jungle. Henry Gee, a senior editor of the journal Nature, has agreed, saying, "Of course it could explain all kinds of legends of the little people. They are almost certainly extinct, but it is possible that there are creatures like this around today. Large mammals are still being found. I don't think the likelihood of finding a new species of human alive is any less than finding a new species of antelope, and that has happened". Gee has also written that "The discovery that Homo floresiensis survived until so very recently, in geological terms, makes it more likely that stories of other mythical, human-like creatures such as Yetis are founded on grains of truth. Now, cryptozoology, the study of such fabulous creatures, can come in from the cold". An alternative suggestion is that Homo floresiensis was actually a rainforest-adapted type of modern Homo sapiens, like Pygmies and Negritos, only of a more extreme type. Whether the specimens represent a new species is a controversial issue within the scientific community.In 2005, a computer-generated model of the skull of Homo floresiensis provided further support that the controversial specimens from Indonesia do indeed represent a new species. The study of the creature's brainpan showed that it was neither a pygmy nor an individual with a malformed skull and brain, as some critics contend. This lends support to the discovery team's assertion that the metre-tall specimen belongs to a species distinct from Homo erectus.In the May 19, 2006, issue of the journal Science, however, Robert D. Martin of the Field Museum in Chicago and some co-authors argued that the fossil of Homo floresiensis appears to be that of a modern human with microencephaly, a disorder resulting in a small brain and other defects.